Deluxe Coaster Set. High end coaster set excellent for promotional purposes. 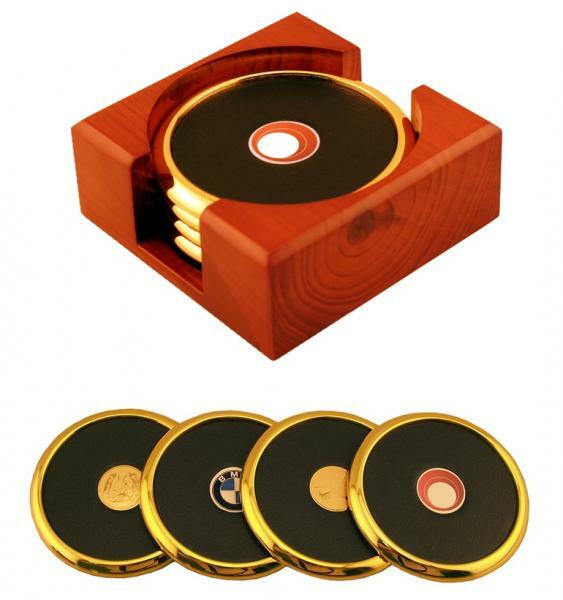 Heavy weight tarnish resistant polished gold metal coasters in set of 4 with hand-crafted wooden holder in mahogany finish. Coasters are 93mm in diameter with a dark leather-feel top. Centre of coaster is recessed with double-sided adhesive to accept a 25mm disc. Base of each coaster is black felt & the wooden holder has felt underneath to protect surfaces from scratching.